Despite popular belief, salads aren’t always waistline-friendly. Some actually pile on more calories than a fast food burger and fries. Use this post to help you build a better salad. 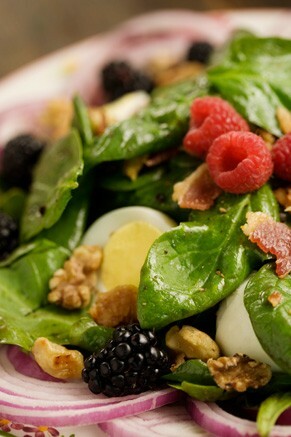 Eating salad can be a great way to boost important nutrients in your diet. One study published in the Journal of the American Dietetic Association, found that just one salad serving per day boosted blood levels of folic acid, vitamins C and E, lycopene and carotenoids in the bloodstream and another study found that eating a large salad as your starter can reduce the overall calories you eat in that meal by 12 percent! You can easily build your own salad from a salad bar that tops 1,000 calories and many restaurant salads have sky-high calories counts. An Applebee’s Grilled Shrimp ‘N Spinach Salad has 960 calories and 65g fat and California Pizza Kitchen’s California Cobb with Ranch Dressing carries 940 calories and 72g fat. Toppings that make salads rich in calories and unhealthy saturated fat include full-fat dressing, cheese, croutons, and mayo-rich options like tuna or egg salad. The best choices are obvious: salad greens, any raw or cooked veggies; beans; lean proteins like chicken or turkey and a light (not fat free) dressing. Nice Recipe… I am going to try it.